Anyone that lives in the area knows the Ritz in Dearborn is no more. It was sold last year, and out of the remodeling rubble The Henry has emerged. 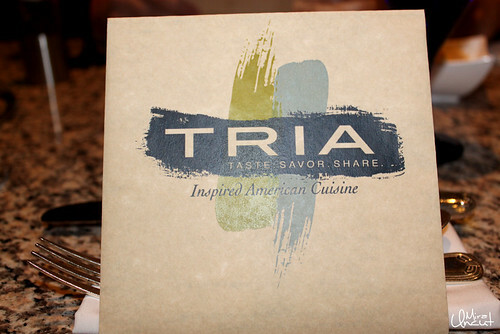 Within its walls is Tria, a restaurant described as “An American Brasserie”. I wasn’t sure what to expect when the hubby and I were invited to dinner there. I was expecting maybe an even stuffier albeit updated version of the Ritz restaurant. Let me just say, I didn’t imagine the swanky, modern and luxurious decor that greeted us as we walked into the hotel. 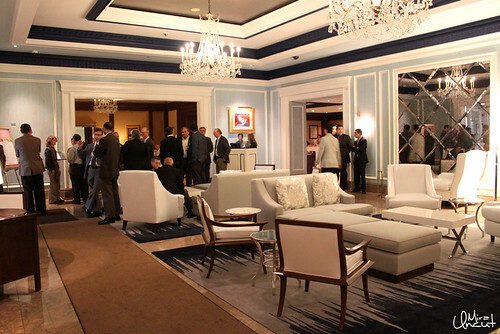 Blue, silver and white tones, crystal chandeliers, huge mirrors and amazing art. I was impressed, and its hard to really impress me. The restaurant has a good sized bar, and a mixed style of tables. The menus were already at our tables. They were folded and sat like pyramids. The menu selection is great. 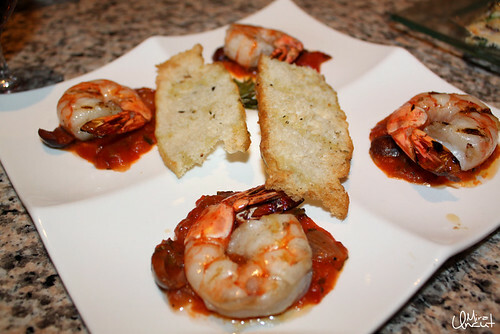 They have tapas style specialties and they also have dinner plates. 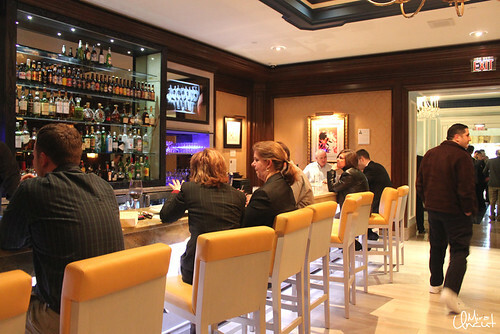 There is something for everyone whether you are famished from a long trip or want to snack and enjoy drinks in between meetings. 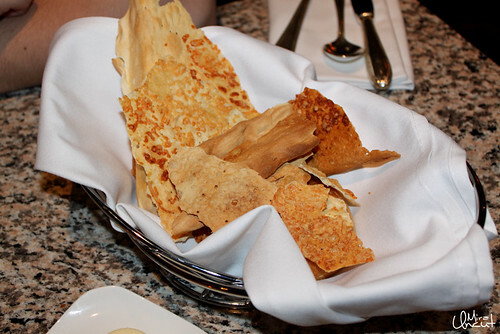 The meal started off with the complimentary bread. If you know anything about me, you should know that I thoroughly enjoy appetizers, even more than the dinner itself. 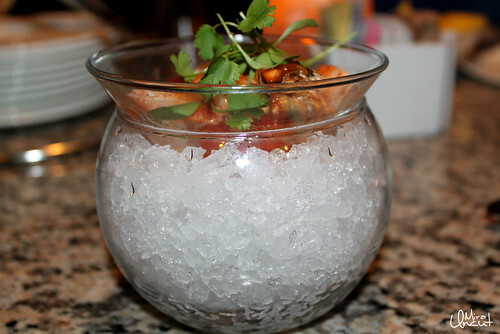 It was playfully presented in an ice bowl. I really loved the presentation. It was a great start to the meal. Cold and crisp. Buttery crab and shrimp. I would have liked a less sauce and less powerful herbs (I believe it was parsley) so I could taste the sea food even more, but I still loved it. 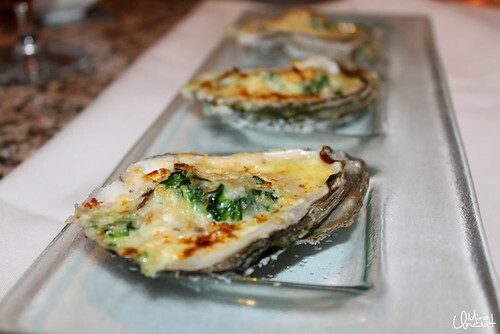 Next up was the waitresses recommendation Oysters Rockefeller – fresh shucked oysters, pernod cream, spinach, bacon parmesan crust ($9). I asked for it without the bacon. The oysters looked beautiful. They were good, but not really my favorite. 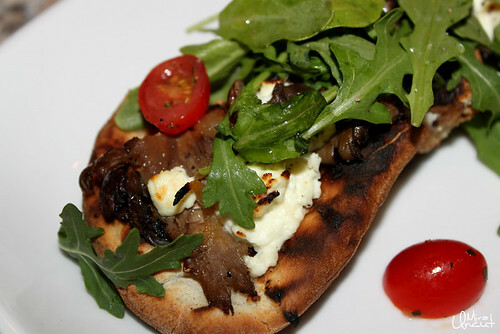 The Woodland Mushroom Flat Bread was one of our favorite things of the dinner. 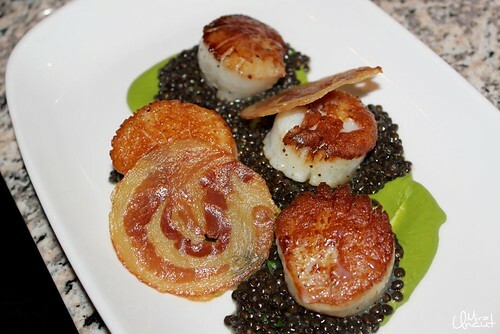 It is always the simple dishes that are executed so well, they capture your heart. 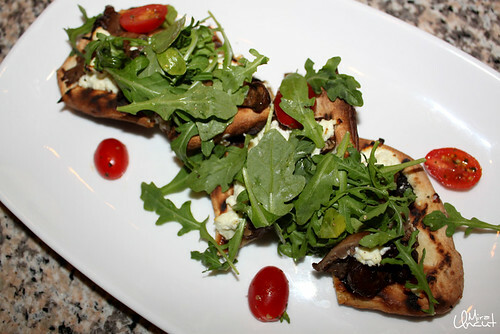 It has caramelized onions, chevre, arugula, truffle oil ($7). Grilled bread, tangy goat cheese, bitter greens and all dressed nicely. Just perfect. Maybe its just a soft spot for caramelized onions. You can never go wrong with them. My hubby wanted a vegetarian pasta so they modified their fettuccine for him. 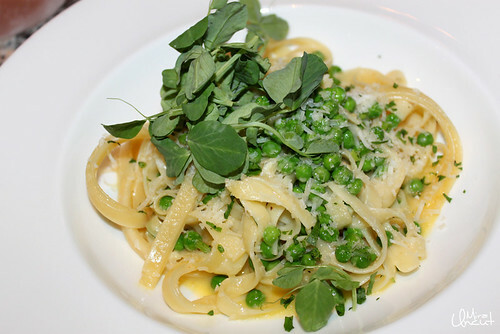 Creamy sauce, fresh peas, and sprinklings of cheese. 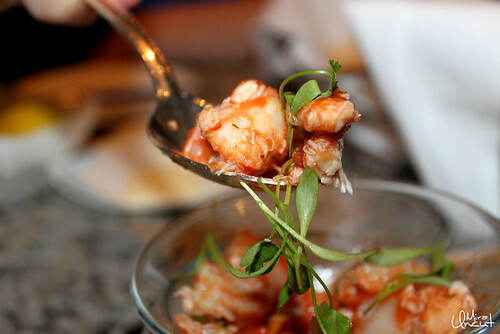 The shrimp was big and so succulent. It was some of the best shrimp I had had in a while. I couldn’t really pick up on the rosemary, but that didn’t matter to me. Rosemary could easily overwhelm the dish, and I’m glad it was subtle. The olives in the tomato sauce were a really good element. All sides at Tria are $5. I like sides almost as much as I like appetizer. 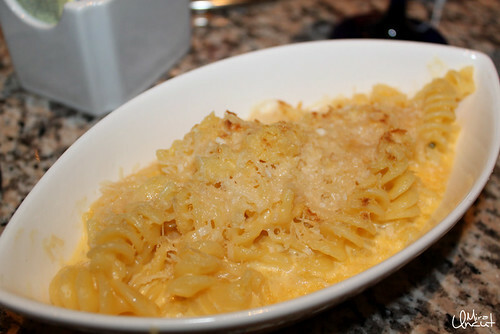 Its a way to taste more things, and usually fulfill my carb obsession. The House Tater Tots were a revelation! 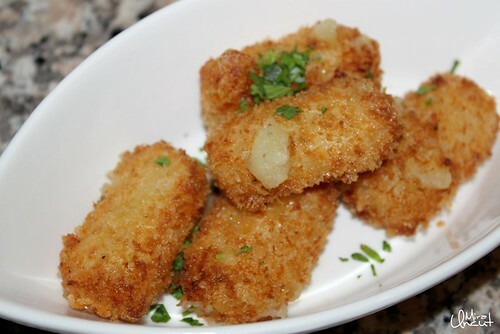 Crispy on the outside, but like creamy liquidy mashed potatoes on the inside. Absolutely amazing. The Butter Whipped Potato was also so good.My carb craving was very much extinguished after these sides. For dessert, I usually go with the light and fruity route. 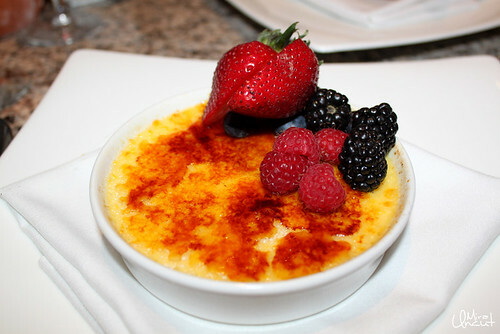 I did find my absolute all time favorite thing in the whole wide world, Creme Brulee ($8). I am a discerning creme brulee snob. If the crust is too thick its ruined, if its not fresh I can tell, and if its made with less than quality ingredients I scream bloody murder. This was AH-mazing. Seriously. 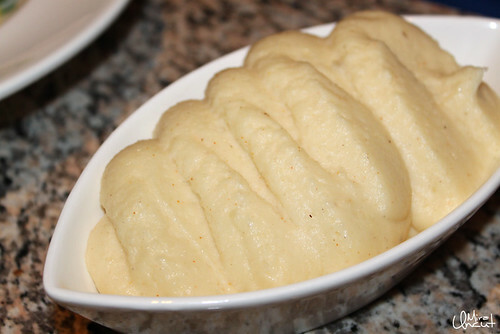 Perfect and a really healthy portion which is great for sharing. Two could easily eat this. The ingredients used were fantastic. I could see the vanilla bean in the custard. No cheap vanilla essence here. I have gone back since then and had this again! The hubby went with the Sorbet Sampling. It was raspberry, mango and lemon sorbet. It was like eating real mangoes! 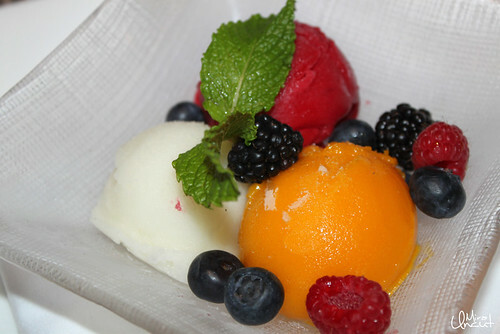 These house-made sorbets were so pure tasting and so delightful and refreshing to eat. 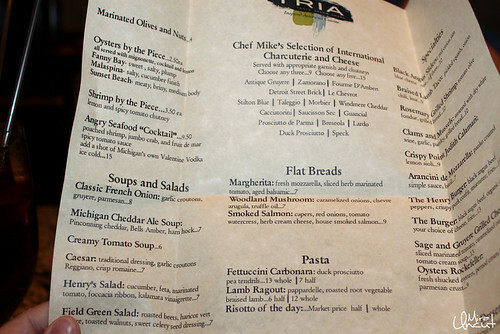 Tria is a welcome breath of fresh air to the Dearborn area. I would definitely recommend it. They have something for everyone. 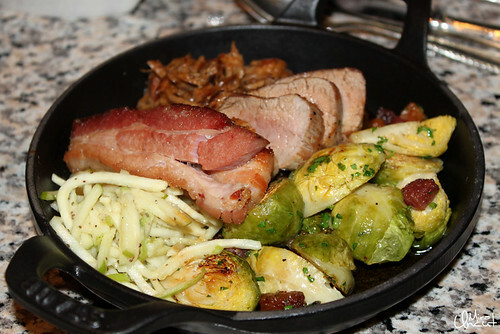 It is a step forward in the city’s culinary scene. A restaurant with an imaginative menu, along with fresh great quality ingredients helps fill a void that I have longingly wanted addressed. 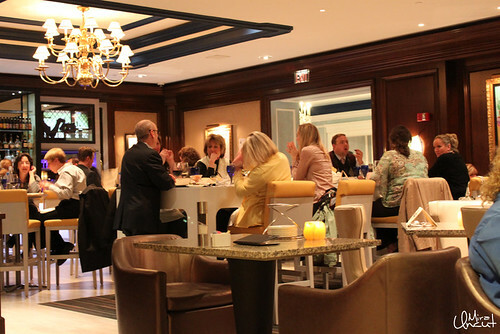 The decor and ambiance is divine, and the wait staff is impeccable. They also plan on having lots of “shows” coming up with their award wining pastry chef doing things like making a wedding cake in the dinning room. To keep up to date on all this you can find them on Facebook. p.s. Occasionally I accept dinner invitations, which in this case the food was provided for by Tria but all opinions as always are my own. ++Mira++ posted this article under restaurant reviews, reviews	on Saturday, July 2nd, 2011 at 1:28 am	You can follow any responses to this entry through the RSS 2.0 feed. You can leave a comment or trackback from your own site. View Technorati Linkbacks. This article has 9285 commentshttp%3A%2F%2Fwww.mirauncut.com%2Ftria-the-henry-autograph-collection-dearborn%2FTria+-+The+Henry+Autograph+Collection+-+Dearborn2011-07-02+05%3A28%3A07%2B%2BMira%2B%2Bhttp%3A%2F%2Fwww.mirauncut.com%2F%3Fp%3D928 so far! i gotta try this place it looks amazing!! thanks for the post mira! cool blog!!!! Their dishes all have amazing presentations! Have you been? No, have not been there. Looks good.